A careless driver was caught out after his antics were caught on camera by traffic officers. Video footage recorded by Highways England traffic officers led to a BMW driver admitting a charge of careless driving. Highways England traffic officers have both front and rear-facing cameras fitted to their vehicles. Jeremy Dillon, 51, was due to appear at court earlier this month, but admitted the charge by post. he court heard how, on May 4 at around 5.30pm, the Highways England officers were in a vehicle heading a rolling roadblock put into place to allow an obstruction from the carriageway on the M6 northbound to be removed. As the officers began the roadblock they noticed a BMW driving very close behind them and switching lanes, giving the officers the impression he was trying to get past. The driver was seen to remove his hands from the wheel and, at one point, wave both of his arms out of the car window. Dillon was subsequently interviewed by Cumbria Police. He initially told officers that he felt his driving was not careless. However, his actions were captured on the Highways England vehicle’s rear-facing camera, near junction 44, near Carlisle. 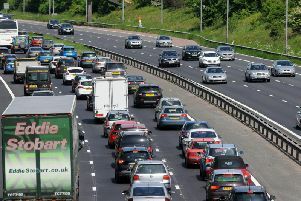 When Dillon was shown the footage, he accepted the distance between his own car and the Highways England vehicle would amount to driving without due care and attention. Dillon said he could not recall sticking his arms out of the car window but accepted it was a “stupid act”. He could not provide a reason for his behaviour other than being annoyed at being held up by the roadblock. Dillon, of Hespek Raise, Carlisle, was fined £286 and received six penalty points on his licence. Police Constable Kevin Bestford said: “The Highways England traffic officers were carrying out an important piece of work to keep all road users on the M6 safe. A successful rolling roadblock requires concentration and skilled driving and the last thing these officers needed to deal with was someone driving far too close, attempting to pass and waving their arms out of the car window. To help boost safety for traffic officers and other road workers dealing with motorway incidents, all Highways England’s 200 high-visibility traffic officer vehicles were fitted with front and rear CCTV cameras last year. “We’d like to thank Cumbria Police for pursuing this case which is one of the first such cases in the country where footage from one of our traffic officer vehicles has helped in the prosecution of a driver. The safety of people working on our roads has to be our priority. This case is a message to all drivers that we expect them to show patience and respect to road workers who may be repairing a road or trying to get road users back on the move again after a serious incident..